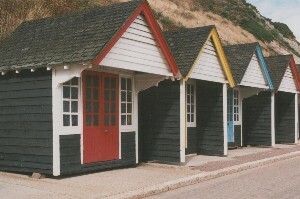 Brightly coloured beach huts are an essential part of the British coast. They go together with ice creams, sandcastles and the unreliable British weather to form part of our experience of summer by the seaside. Recently the spirit of nostalgia for the British coast has meant that beach huts, in some locations, can sell for more money than houses in other areas and given that you cannot stay overnight in them and many need annual maintenance, this is really saying something! 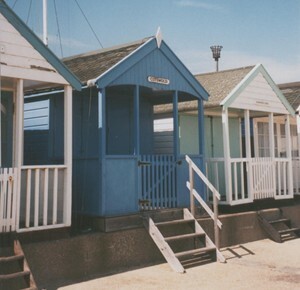 Beach huts really started to be used in the early years of the twentieth century. Before then, bathing had been a cumbersome and expensive affair. Men and women bathed on separate beaches and changing for a dip in the ocean was performed out of view in a bathing machine, which was towed a safe distance out to sea before the nervous bather took his or her plunge into the often uninvitingly cold sea water. When we finally dispensed with the bathing machine many were left abandoned on the beach. In the Edwardian era and in the years following the First World War, the sight of people of both sexes in bathing costumes had become acceptable. However, changing in public was frowned upon and could result in a fine, even if decency was preserved under a Macintosh - so called "Macintosh Bathing". Hence councils provided and charged for beach huts to change in. Enterprising people made use of the abandoned bathing machines by removing the wheels and turning them into beach huts. 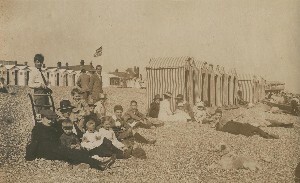 As an alternative to the beach hut, some seaside towns provided tents for hire, along with deck chairs. These were often brightly coloured and decorated with stripes. Now you can buy your own beach hut or hire one for the day or a week. They make a great base for a family on a beach holiday. Many are equipped with small stoves for boiling kettles, essential for the British afternoon cup of tea. A few years ago, the beach hut was languishing in the depths of unfashionability. In my youth it was something old people used. Today it has been swept up on a tide of nostalgia and now takes its proper place as an essential part of the British seaside holiday. 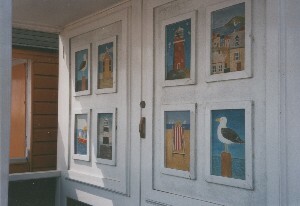 This detail is from the doors of a hut at Southwold (as are those pictured at the top of the article). Southwold, more than any other resort, seems to epitomise the spirit of the pre-war British holiday. It has some of the country's best beach huts. 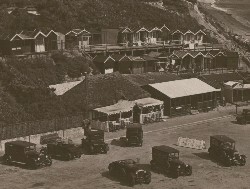 These solidly built huts (right) date from the thirties. They resemble a row of suburban houses along the sea front. More from the Bournemouth area. 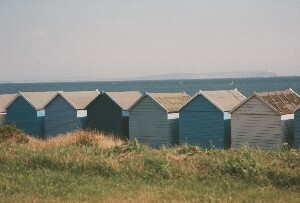 These huts in green and blue are at Avon Beach. This shot was taken in the thirties. A group of vintage cars at Branksome Chine, Bournemouth. In the background are some original beach huts. Hayling Island, near Portsmouth, can be accessed via a bridge. It seems to be a little cut off from the mainland and hence appears to survive as a little corner of the traditional English coast, relatively unspoilt by commercialism. There are amusement arcades and a fairground, but it's all pretty low key. For the most part, Hayling is quiet and peaceful. 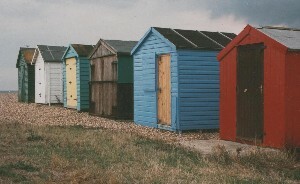 These beach huts in bright colours help lend charm to the seafront.